Updated for 2017: Find the best ERP for your SMB. Gain new insights on cloud ERP in this enhanced eBook from SMB Group. Today’s technology solutions can help companies do amazing things. So why do 68% of small and medium-sized businesses (SMBs) still say that technology solutions either only support basic business needs, or fail to deliver business results? It’s because they’re using the wrong software. The ideal ERP system for your SMB will let you keep pace with technology requirements without putting a strain on your limited budget and resources. Learn how to find such a system in a new and improved eBook from SMB Group. The top 8 reasons SMBs choose cloud ERP. The pros and cons of the three types of cloud ERP deployment. How to avoid falling for Faux Cloud ERP. Why public cloud providers often deliver better security than SMB IT shops. 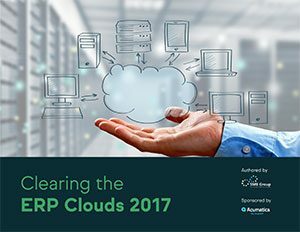 How to future-proof your business with cloud ERP. Don’t miss these insider tips on finding an ERP for SMB. Just enter your information, and this e-book will be yours in seconds. Get free eBook from SMB Group!